Since I’m going to be starting work tomorrow for the next three months, I decided to do an encore review of the one other set I have that wasn’t opened. After this, the stage will be left open for everyone else! 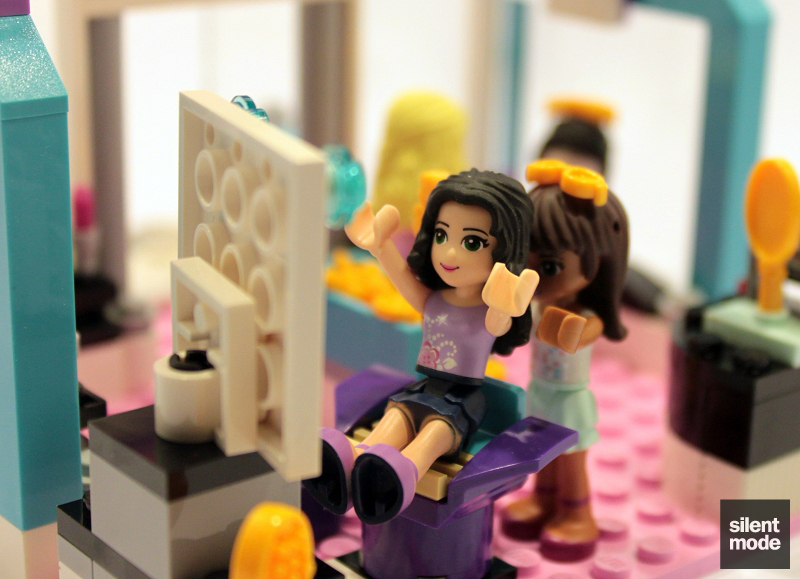 It’s a busy day of beauty fun down at the Butterfly Beauty Shop! 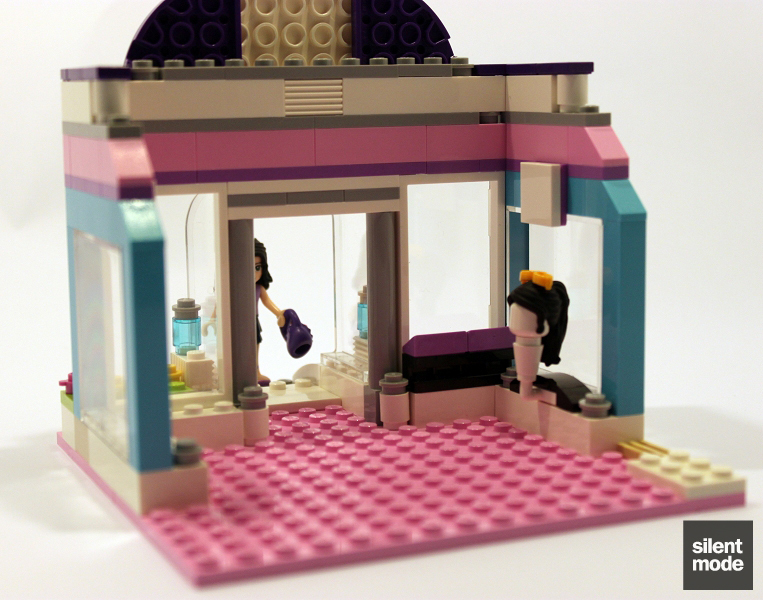 Emma loves this posh little salon at the center of Heartlake City! Shop for lipstick, makeup and hair accessories! 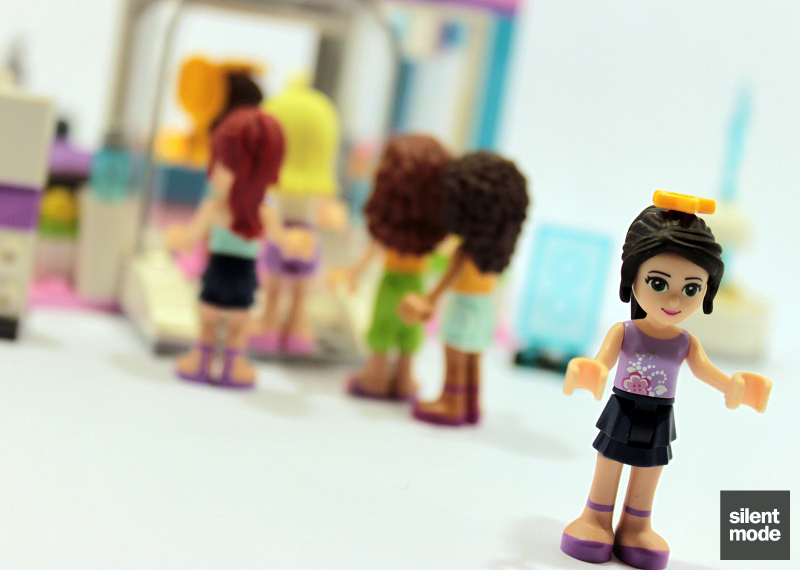 Emma and all of her friends will look fabulous with bows, sunglasses, a hairbrush, mirror, lipsticks and new hair styles. 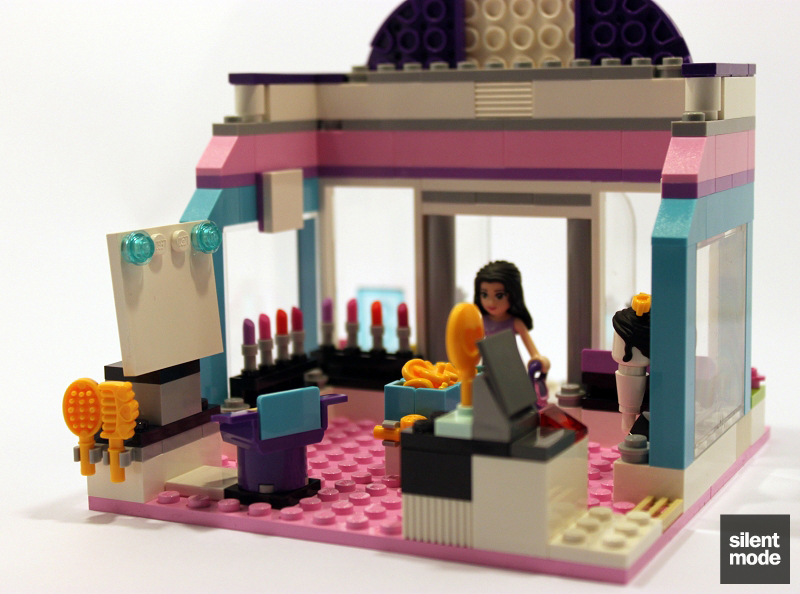 Get the girls ready for any event with the salon where you can rearrange the interior! Includes Emma and Sarah mini-doll figures. 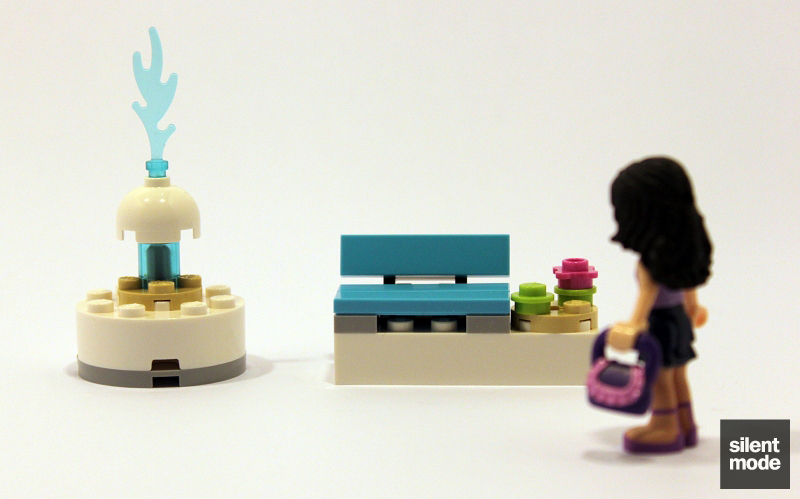 Gossip out on the bench by the scenic fountain! Before I begin: please read the intro carefully. 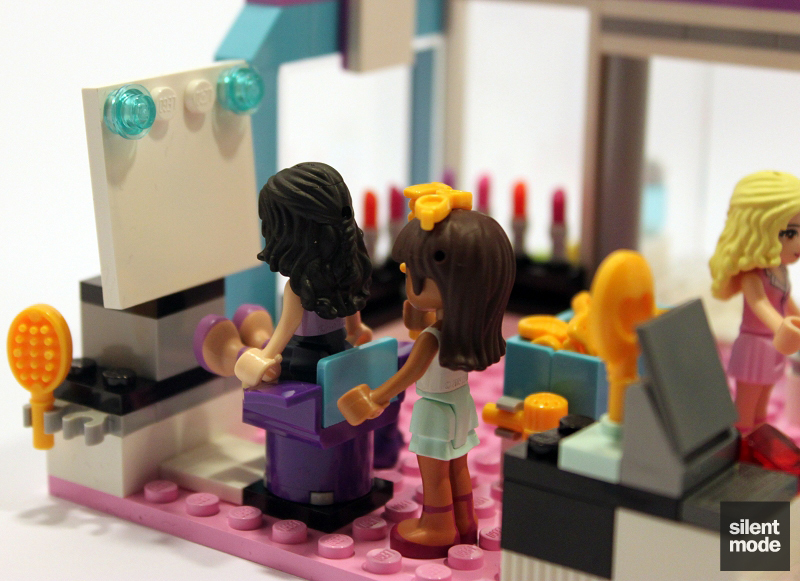 Your minidolls will not be getting pimped as a result of going to the Beauty Shop… at least not under normal circumstances. 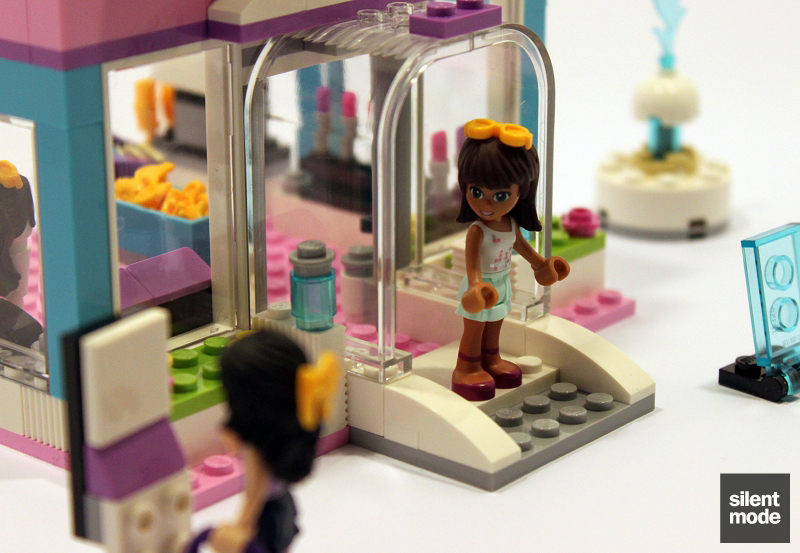 In my last Friends review for the time being, I will be investigating the Beauty Shop: its main talking points from the outset being the available accessories (which is a given, given that it’s a beauty parlour), and of course the second of two dark-skinned characters. Especially at this price point, I’m hoping the set will fare better than some of my previous outings – but we’ll see, won’t we? The back of the box pretty much ruins any suspense we have about this set: all the play features and accessories are exposed for the world to see, most notably the included accessories. 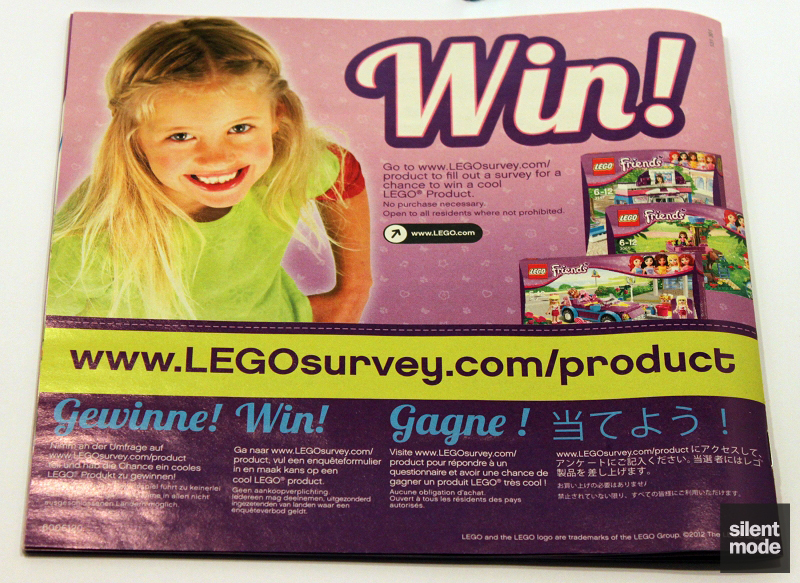 Way to go, LEGO. 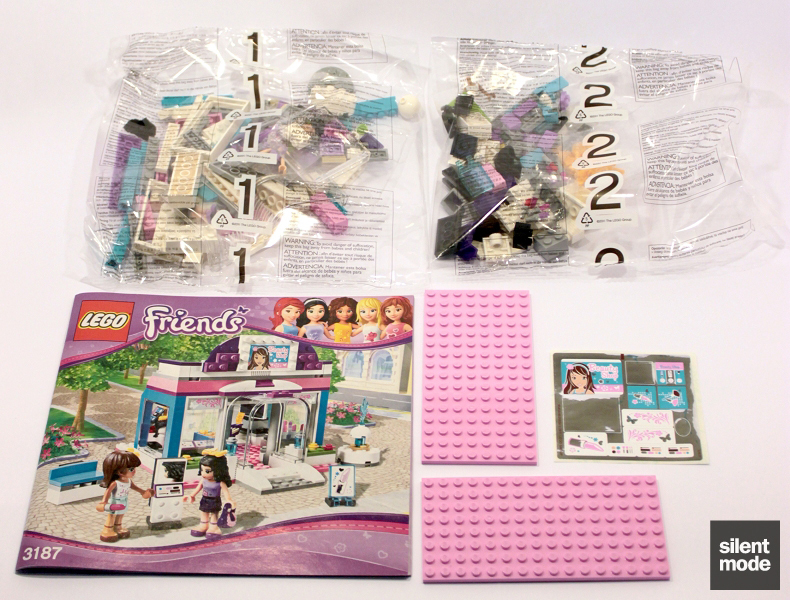 Also pictured on the back are the equivalent sets for the other main characters, in descending price order: rich girl Olivia’s house on the left, all the way to equally rich girl Stephanie’s car. Emma is the featured character in this set, who (along with Olivia) has not been in a poor set so far. Something a little different this time: Emma is shown to scale, except horizontally. Being one of the pricier sets, this box is curved. Two bags again, but as a sight for sore eyes they are both numbered. It’s been a while since I’ve reviewed Heartlake Vet, so I’m not used to seeing this much inside a box. 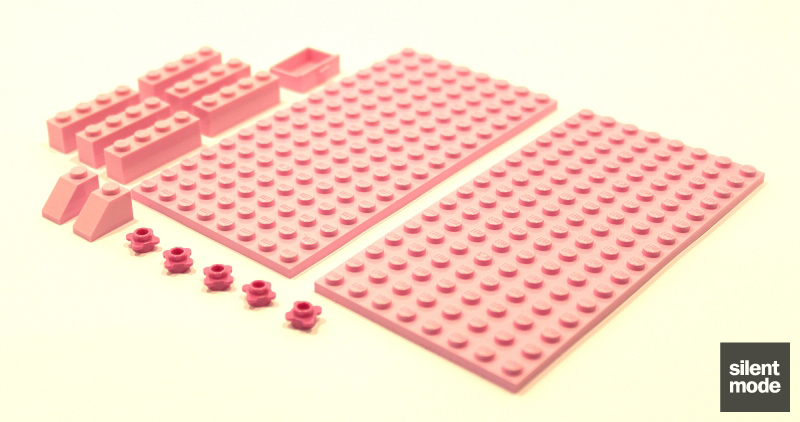 Immediately noticeable are two 8×16 plates in Bright Pink, and a DSS (dreaded sticker sheet). But what’s this? 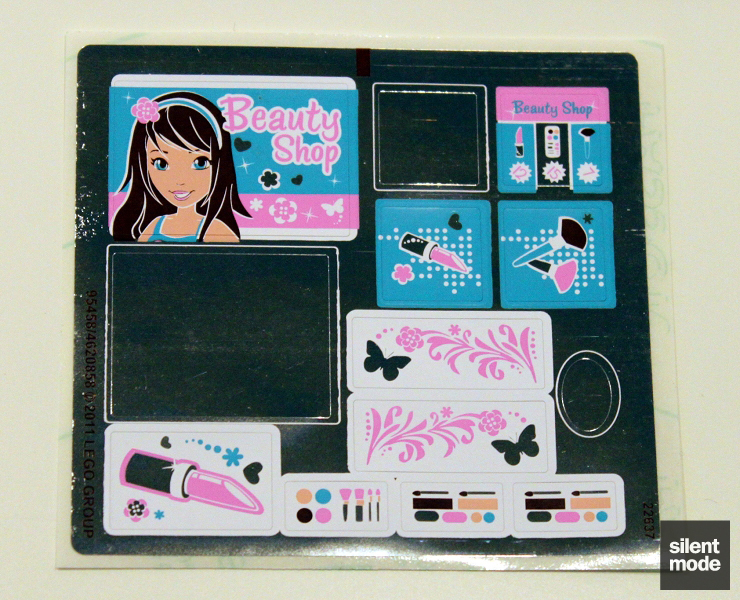 This DSS has a metallic backing, so some of the stickers on this sheet will act as mirrors, and the others each have a metallic element to them. I haven’t used any of these in the build that follows. The dismembered parts of homegirl Emma, and the supporting character Sarah. 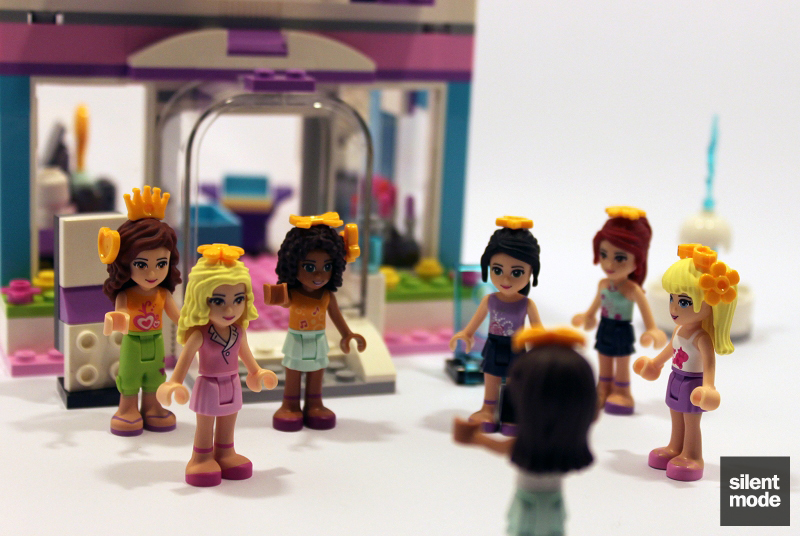 Note there are three hairpieces: one of them is the black version of Mia’s hairstyle, and goes in the Beauty Shop. 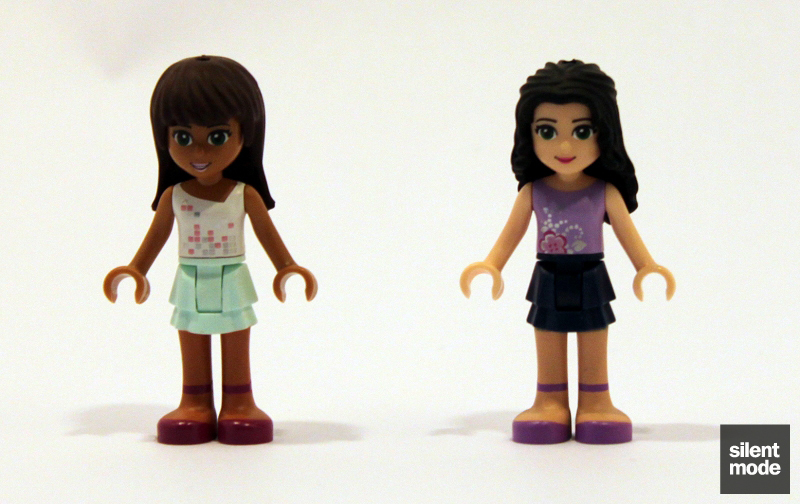 From left to right: Emma from Emma’s Splash Pool (3931), Emma’s Fashion Design Studio (3936) and in this set. While it’s not a real problem as you can switch torsos with many other minidolls, it would have been nice to see Emma with a more glamorous top half. Then again, it appears as if Emma is meant to be the “wallflower” of the main five. 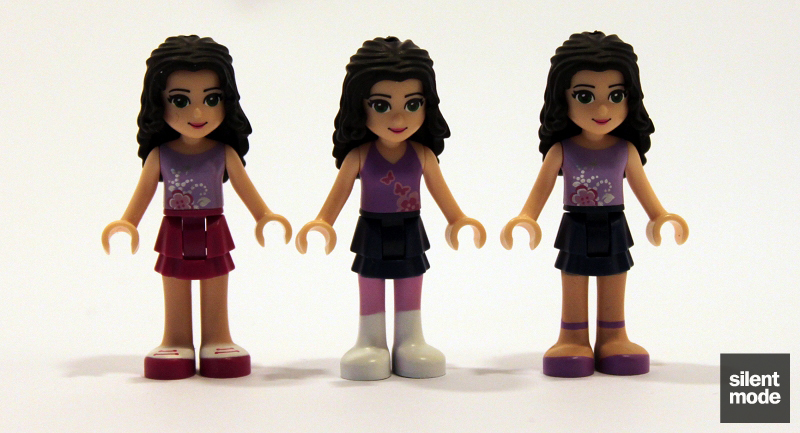 Sarah (I keep calling her Sophie for some reason) has the same skin colour as Andrea, as was confirmed elsewhere. We can see this when we compare her to the Andrea from the City Park Café (3061) and the Andrea’s Stage (3932) sets. Heck, they even use the same head. Sarah’s hairpiece is the same as Stephanie’s and Sophie’s (from Heartlake Vet). 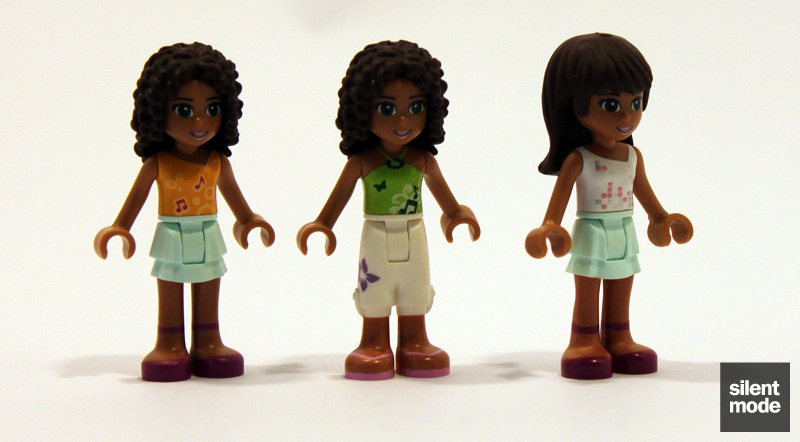 If you’re looking up the different leg parts on Bricklink, bear in mind that the colour of the clothes (in these cases, Light Aqua and White) dictates the part colour – everything else is paint. There’s no shortage of pink in this set, for anyone who likes pink. I did a double-take because I’d only spotted one drawer (which usually comes in twos) – however there is only one drawer in this set. Cheapskates? Not necessarily. Where my trans fans at? This is where things really begin to jump off – we have two 1x6x5 Trans Clear panels and two panes of glass, as well as a couple of transparent curved panels I haven’t seen in a set since Paradisa. 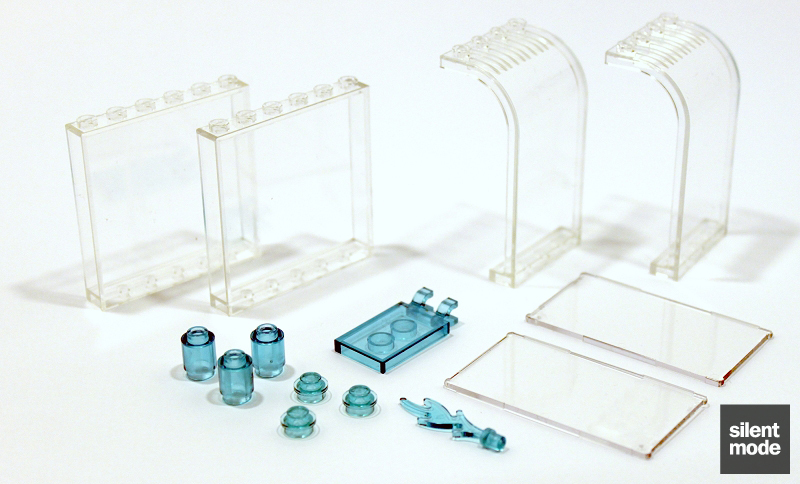 Although the box art depicts the coloured transparent parts as being some kind of new bluish-green colour, they are all actually Trans Light Blue. This is why I have an issue with rendered images, although I can understand why they’re used. There’s a small selection of Dark Purple parts as well: most useful you’ll probably find are the six 1×2 tiles. I’m still not sure what the six “new” colours introduced by the Friends theme are, even after reviewing six sets. It’s apparently two blues, two greens and two purples, but this would include colours already in existence (namely Bright Green, Dark Purple and Medium Blue). The other colours seen (Bright Light Orange, Bright Light Yellow and Magenta) were resurrected. 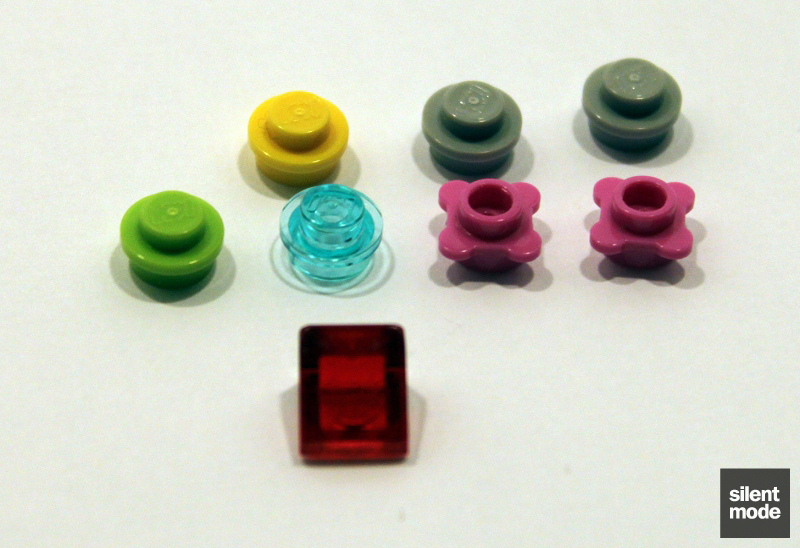 Either way, a number of parts in the new colours can be found in this set. 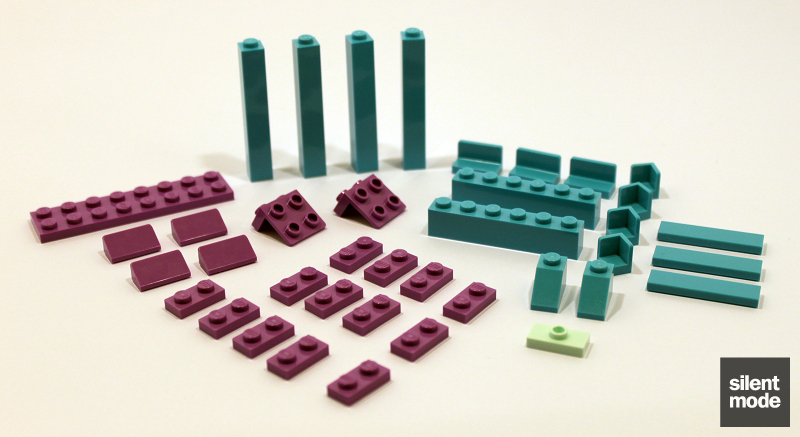 The Medium Azure 1x1x5 bricks, and the Medium Lavender brackets, are currently exclusive to this set. One particular thing I like about these new colours is that they really make Yellow parts look different. 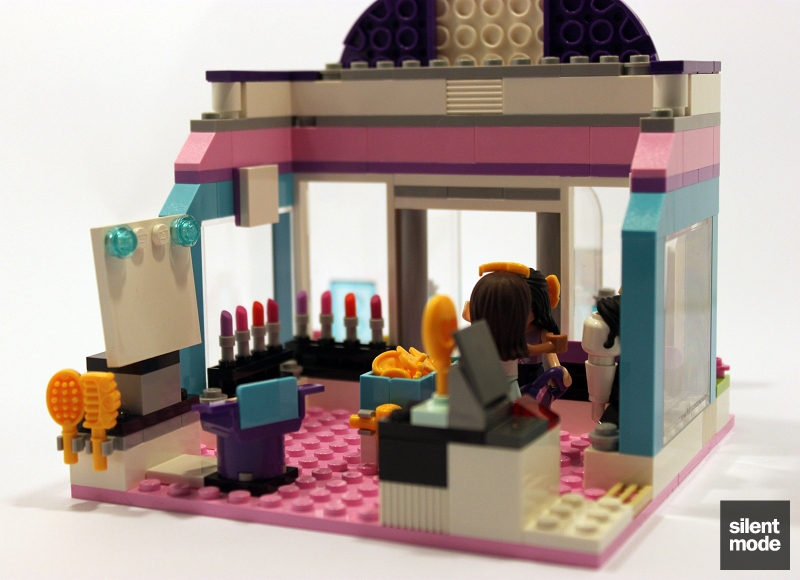 One of the focal points of the Beauty Shop is that it’s home to a number of unique accessories; possibly the most accessories currently available in a Friends set. 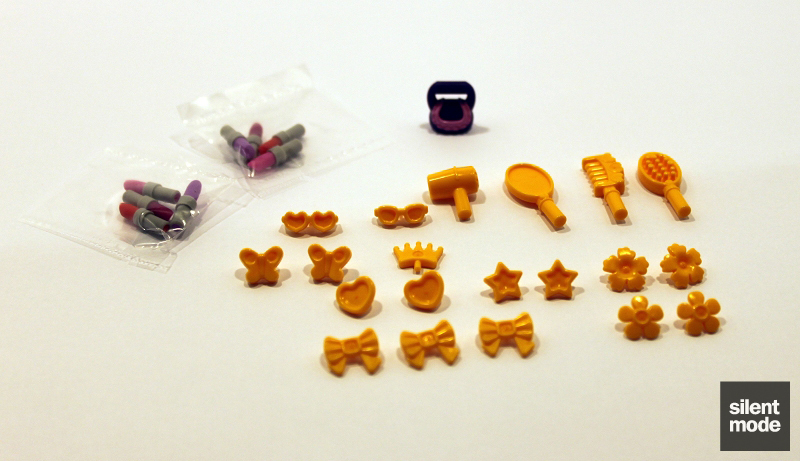 First up we have the accessories in Bright Light Orange, which are mainly hair accessories. If you’re tired of using bows from Mia’s Puppy House, you have plenty of alternatives here – including cutesy “heart” shapes and stars. The two pairs of sunglasses were something that was definitely missing, but it’s a shame we can’t have minidolls wearing them over their eyes. It would also be cool to see some of these accessories in other colours. Finally we have a handbag accessory in Dark Purple. This can be carried in a minidoll’s hand, but can also sit on a single stud. If you’re into accessorising your minidolls it’s a very nice-to-have. Truth be told: I’m not going to put a “Stars of the show” section in this review, because there are just so many awesome parts in this set it would have been time-consuming to show them all. 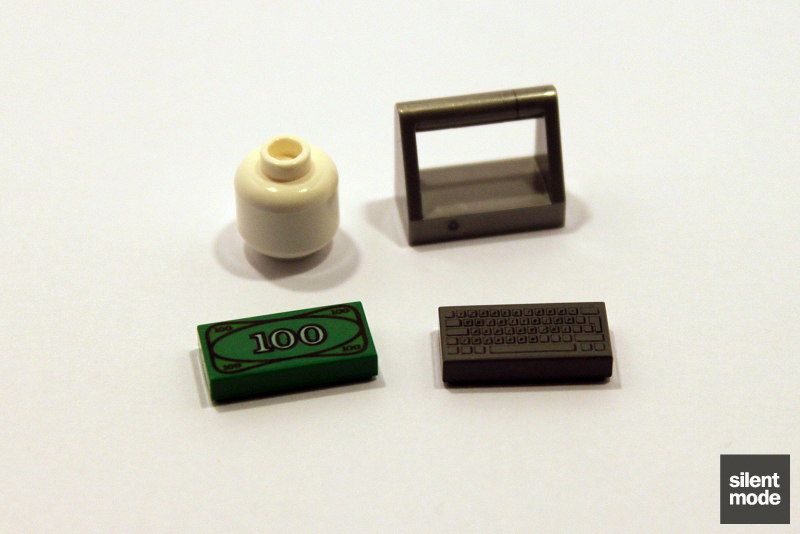 Instead, here are some of the other noteworthy parts: a plain white minifigure head, a money tile, a Flat Silver handle tile, and most interestingly a Dark Bluish Grey printed keyboard tile. 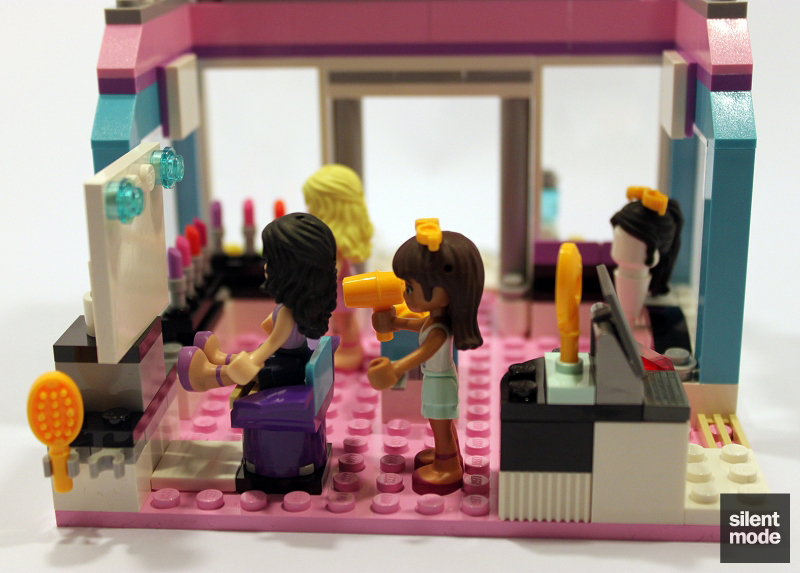 Q: How many minidolls does it take to build a Beauty Shop? A: One to show up and wait for it to be built around her. Here’s Emma with her $50,000 Vil Loutton handbag. 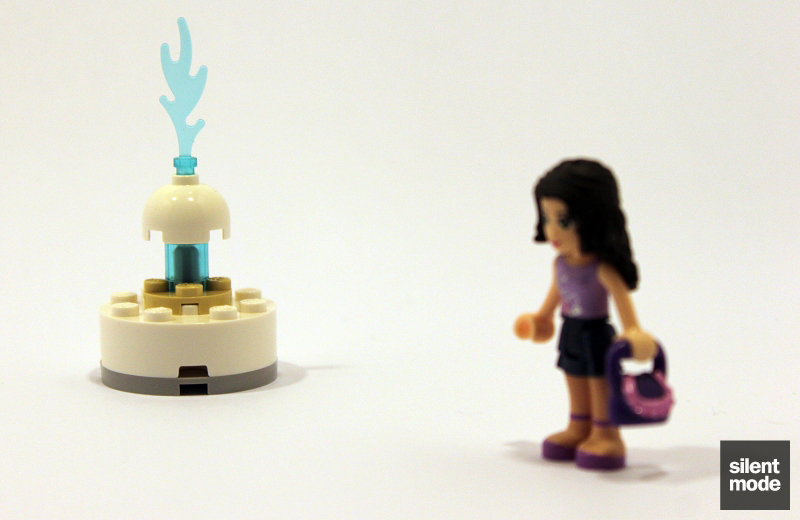 From out of nowhere a small fountain with gushing water – using only eight pieces – appears. Emma then decides to go and sit on the bench, which also appeared from out of nowhere and didn’t faze her at all. 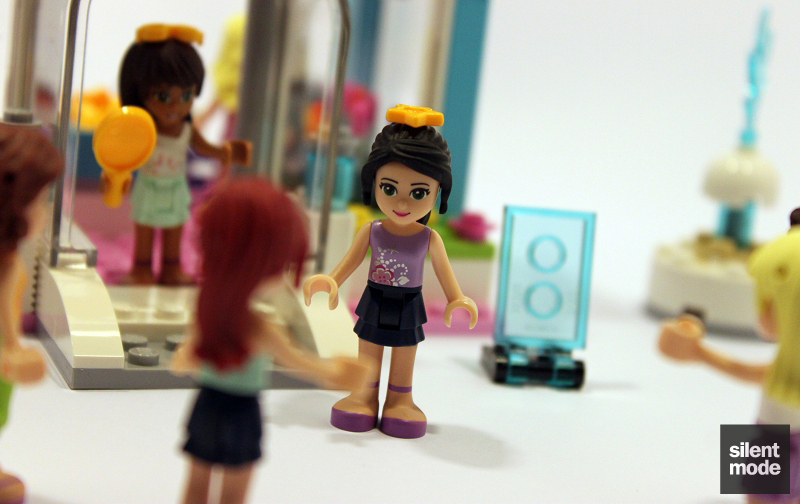 She has no problems sitting on the smooth surface, unlike those minifigures. Sensing absolutely nothing unusual about this scenario, she sits and waits for the Beauty Shop to be constructed entirely out of parts coming from nowhere. 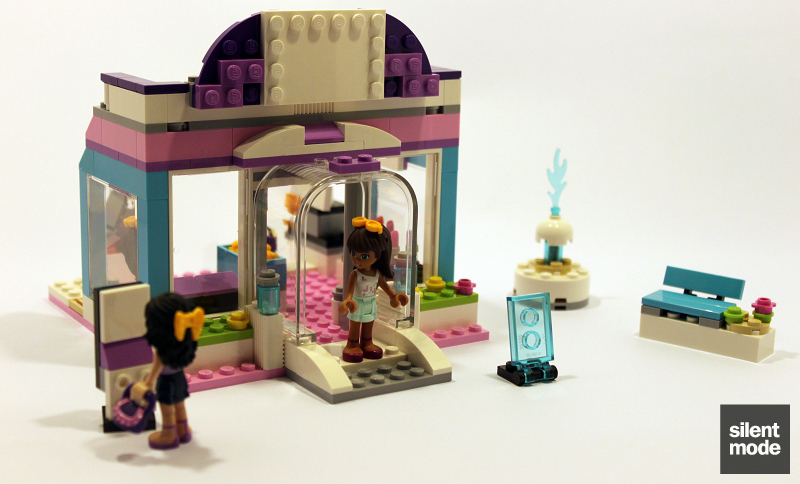 Seeing that the exterior has been completed, Emma decides it’s time to go get her hair did. Here’s the Beauty Shop from the outside, and you’ll see there’s a couple of other things out front. On the right is Lego’s design of a notice board, which has appeared in a few other sets – but this one’s unusual because it’s got a transparent sign. It’s meant to have a sticker on it advertising the beauty shop. On the left is some kind of booth where makeup can be applied. It’s apparent what it’s real function is once the stickers are applied, but it could easily be misinterpreted (or even adapted to be) a cash machine. Unbeknownst to the rest of the world, Sarah has a crush on Emma. Eight leftover parts, including two duplicates (given that these appear in both bags). Stoked to have two flower plates, and the Light Bluish Grey studs will come in useful also. 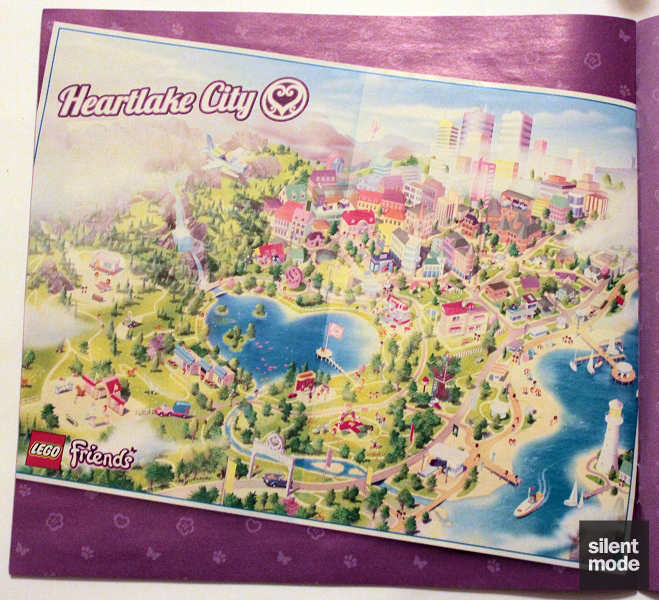 The back of the instructions comes with the Heartlake City map. And here’s Gewinne!th with some beauty tips. It’s another day in Heartlake City, and the Friends are doing what normal people usually do: standing directly in front of the entrance of somewhere they have no intention of going inside, blocking paying customers from entering. Meanwhile Emma is having a hair makeover, seen to personally by Sarah. Quite simply, this set is nice. 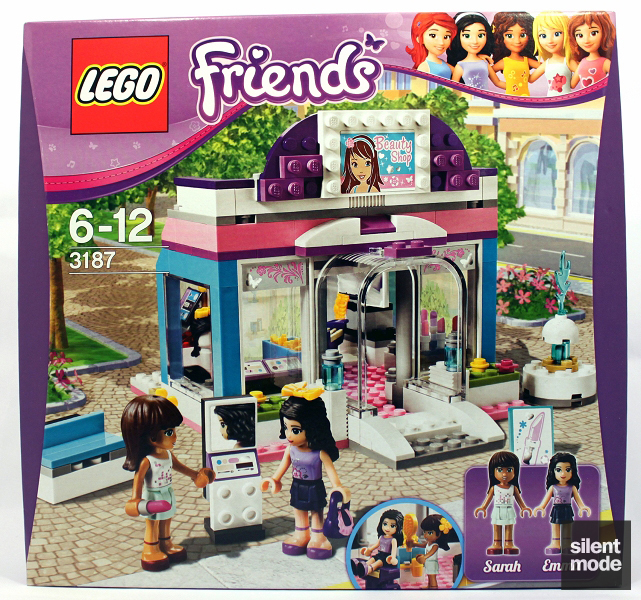 For people who are into the Friends theme: this is probably a must-have set as part of your town, if for no other reason than for the accessories to add to your minidolls. 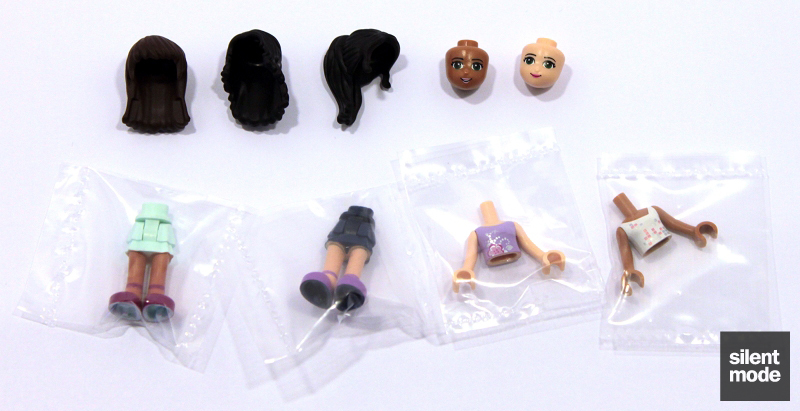 You don’t just have the hair accessories, but also the lipstick parts (and the set really benefits from having two packs instead of just one) and the hair utensils, as well as the extra hairpiece (which looks particularly good on Emma). Any one of the other Friends characters would be right at home in the shop, but you get two figures to play with in case you don’t have any of them. It wouldn’t make much sense to have any less. 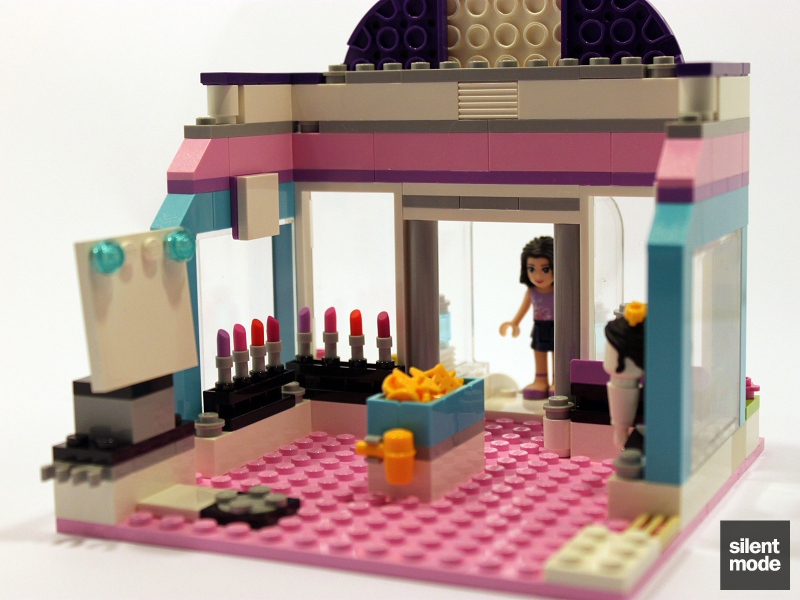 For people who buy sets just for parts: particularly for the new colours, you can’t really get much better than this set without looking at the doll’s house (I mean, Olivia’s House). 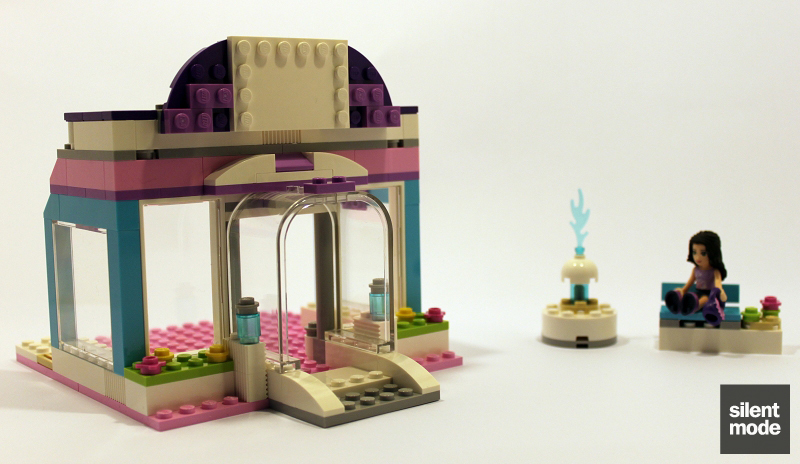 Just about everything in this set is potentially reusable, and there are even a few uncommon and hard to come by parts – especially if you like tiles and transparent pieces. 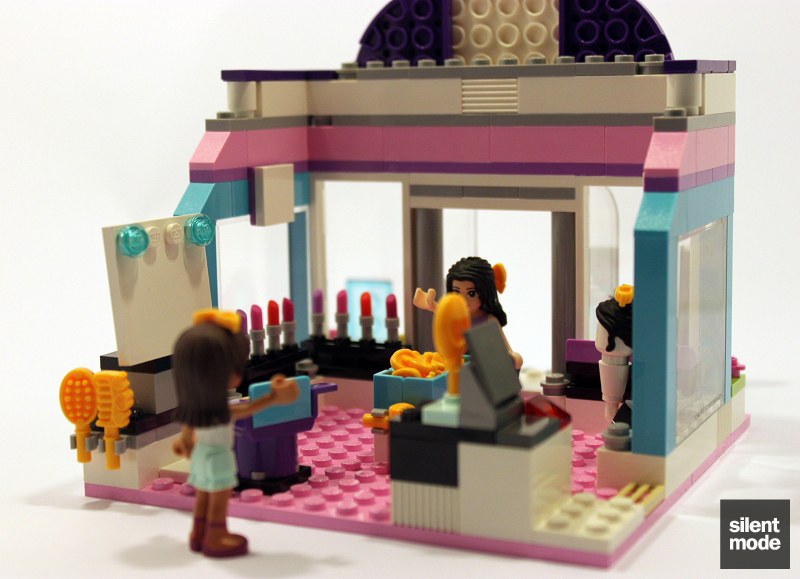 As with the smaller sets, the Beauty Shop set is very well designed, with nothing seeming to be out of place or tacked on as an extra. One small gripe I had would be with the instructions: at a few points after the accessories are introduced, parts are added to the model where they could have been more easily added beforehand – the hairbrush and comb are good examples. The shop itself is open to expansion possibilities. Why not add more salon chairs and units? How about one of those manicure/pedicure tables? The waitress from City Park Café provides an ideal uniform for other members of staff. I can't think of many ways to improve upon the set's design. Besides similar instruction issues to Olivia's Tree House, there were no problems or challenges with the build at all. A very high nine for the numerous accessories, the extra hairpiece and parts in the new colours; if Emma had been given a different torso to the one in Emma's Splash Pool, I'd have probably given a ten. 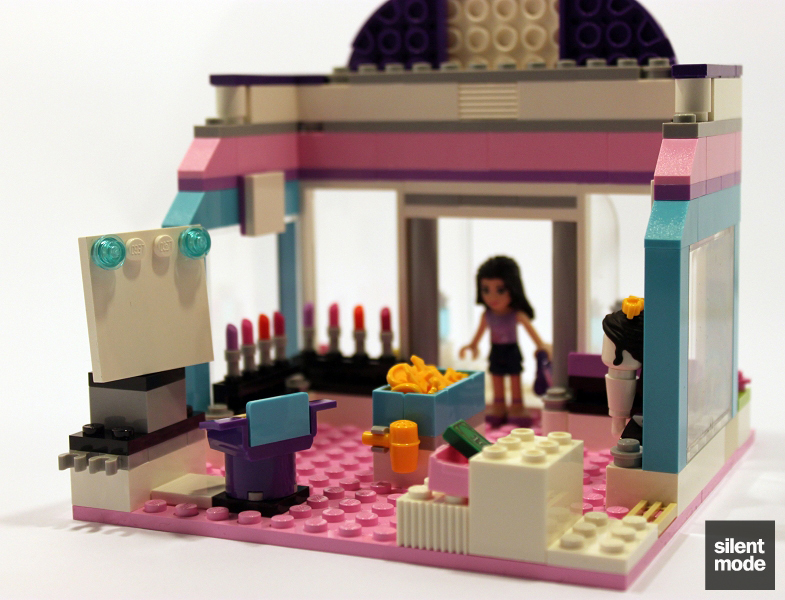 There's plenty to do with the set on its own, if you're into the whole beauty/makeover thing. So far the best set to purchase if you're after accessories for minidolls' hair. Would have to be expanded if you're planning on making over more than one character. While the price appears to be high given the number of parts, consider the kinds of parts you'd be getting, as well as the two minidolls. Definitely worth purchasing if it's discounted. Based on these scores, the Butterfly Beauty Shop gets 8.4/10. It also gets to wear one of my exclusive accessories: the Silent Approval award. Well, that’s it from me for some time. Hope you’ve enjoyed reading my reviews of these sets – and I should note that my masculinity is still intact. Silly geese. Emma and friends after their hair makeovers. My collection of (unique) minidolls.